Wrigley Roster Jenga: Bleeding Cubbie... Green? A very happy St. Patrick's Day to you all. I hope you're all wearing green; otherwise, you may become the victim of an unsuspecting pinch. I myself forgot to wear anything that featured the color prominently (or at all), despite the fact that I bought a properly colored, collared shirt for work just for this occasion. Go me. Now, of course the Cubs and the color blue have been synonymous since before WWII and it's hard to associate any color with the franchise other than Cubbie blue (or a splash of red). As such, you wouldn't think there would be a lot of Northside baseball cards that feature green very prominently, seeing as blue and green are too close to each other on the color wheel. Well, as that reprint from 1954 Topps at the top indicates, despite this similarity, there are certainly a fair amount. More than I expected, to be honest. Here's another reprint set because I am not made of "green." See what I did there? Although it's more of a sea-foam green than an emerald, the original the 1922 E120 American Caramel Baseball Card set was in the holiday spirit - well, at least the NL portion of the checklist anyway (AL cards featured a brown tint). Here are a couple of greened out Cubs as proof. I even picked out the ones with the most Irish-sounding names for added holiday spirit. That's the kind of A+ service you get on Wrigley Roster Jenga. Here are a few greenies from one of my favorite baseball card sets of all-time: 1959 Topps. Bold primary and secondary colors with a simple design is usually a good way to win my heart. It also doesn't hurt when my second favorite color is one of those used in heavy rotation. Blue is obviously my favorite color overall, but we can thank the green Mighty Morphin' Power Ranger for my strong love for the color green as well. Speaking of designs which make use of bold primary and secondary colors... cue 1975 Topps! There are A LOT of vibrant and bold color combinations used throughout this seemingly universally beloved set; however, green on light green isn't exactly one of the best. Nevertheless, they prove to be very useful for a green-themed, St. Patty's Day blog post! 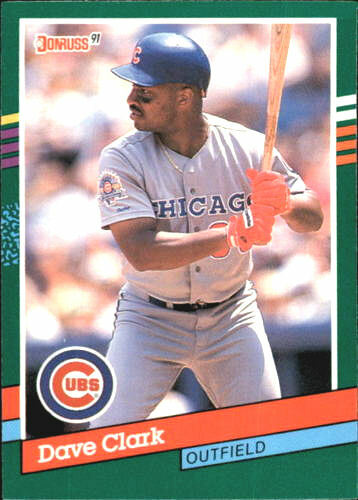 Of course, other companies made use of the topical color, not just Topps. Larry Fritsch lead the oddball charge with his inaugural edition of "One Year Winners," a set which shined the spotlight on players who only appeared in the Majors for a solitary season and never were featured on a contemporary trading card. One might say, with their lack of experience, these players were a little "green." Ba-dum-tiss. Sidebar - I love the concept behind this set and I really wish this idea would be revived today. These players no longer had to be "green with envy" of their peers who got some baseball card love. 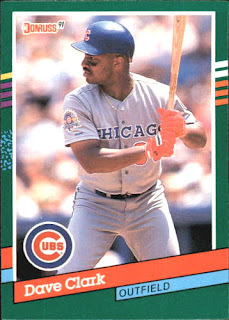 The decade of the 90's (especially the early portion of the decade) was famous for it's use of loud, clashing colors for seemingly no reason and this culture bled into baseball card design. While 1991 Score might be pretty tame compared to some other off-the-wall designs (I'm looking at you Metal Universe and anything Pacific), their rotating border colors were definitely in with the times. Black, white, blue and, of course, green were cycled through for the checklist, regardless of team affiliation. Although, that "green" is probably more of a turquoise, but I say close enough. Sue me. 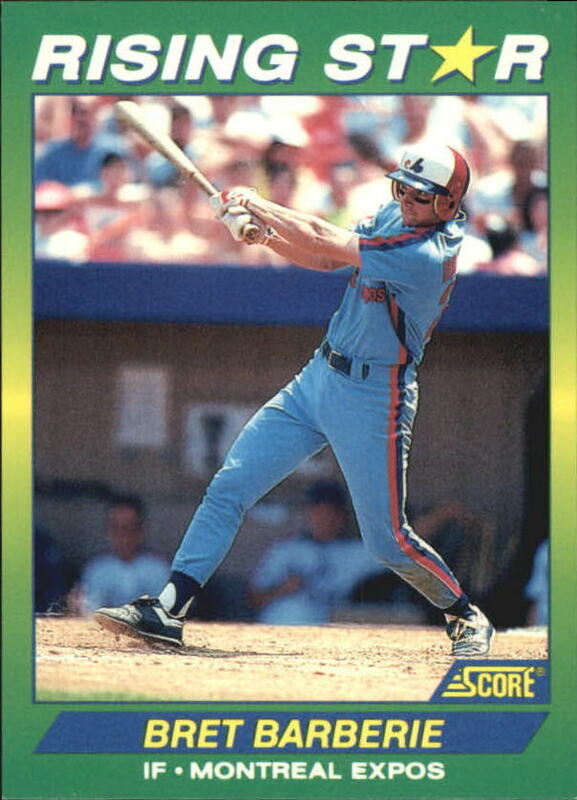 Donruss wanted in on the multi-color action that year too; but, their release was slightly less enthusiastic as it only included green and blue. However, it also switched between colors all willy nilly as well, I believe. Speaking of crazy colors, how about those bright orange batting gloves being sported by Dave Clark? You could see those things from space! A little bit of yellow intrudes on the border found in Score's 1994 edition of "Rising Star" cards, green is still the "star" attraction. The puns... I can't....stop. I can thank the Night Owl for the Frank Castillo on the left; it came with a larger trade package that'll be showing off in the next few days and it was my first actual Cubs card from the set. 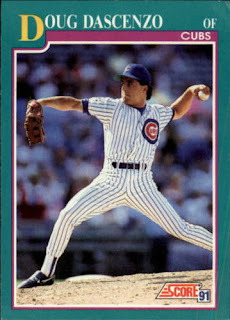 I already had the Barberie, who later played with the Cubs for 15 games in 1996 to close out his career. Though it's not technically a Cubs card, Frankie looked a little lonely all by his lonesome. This might be my personal favorite set of green Cubbies - 1995 Conlon Collection. The ante was upped in the farewell Conlon release, going with the forest green border and gold foil/stamping rather than their usual plain, black & white framing. I feel like the dark green border really makes Charles Conlon's photography pop and the foil isn't overused either; it's just a shame that the baseball strike put the kibosh on this product. It's heavy inclusion of relatively obscure players was really helpful for my Cubs All-Time Roster Collection too. Additionally, that may very well be a real, authentic Billy Jurges autograph on the top left; but, I'm not really sure either. We've also got some super duper shiny green thanks to Rick Wilkin's statistical anomaly of a 1993 season (30 homers, .303 avg), which got him included in the 1994 edition of Topps Finest. Pre and post-1993, he was anything but "Finest" material though. 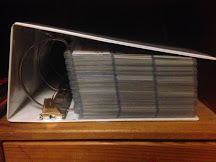 Then there's 2000 Topps, which I don't think I've seen any blogger write positively about - neutral maybe, but no real praise though. Again, we're kinda teetering between green and turquoise; however, Willie's actual last name is Green(e), so that has swing the balance into green's favor, right? We got a rare look at Lou Brock in Cubbie blue in 2001, courtesy of Topps American Pie. it may have a green border, but seeing Lou in a Chicago uniform reminds me of the horrid trade that lead him to St. Louis; thusly, all I can see is the color red. Bobby Scales and Randy Wells are both sporting the green caps provided by all Major League clubs in Spring Training action annually on March 17th. It may be a scheme to sell a few more souvenirs to people with deep wallets and the colors might clash like Braveheart, but I kind of like it. Our team's neighbor to the south has a heritage much more rooted in Irish culture, seeing as the Southside of Chicago had/has a prominent Irish-American population. In addition to the green Spring Training caps, they also trot out green caps and uniforms on September 9th every year (halfway to St. Patty's Day). That's a marketing gimmick if I've ever heard one. 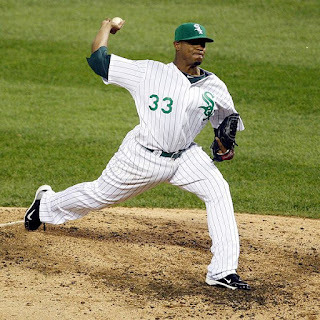 Future Cub disappointment Edwin Jackson as a Soxside Irish. Thus concludes my "green-i-fied" St. Patrick's Day post. When I started gathering the material to draft this post, I fully expected to have to milk it hard to get enough content. Needless to say, I was rather surprised to find as many green Cubs cards as I did. I'm thoroughly grateful though; last year's uninspired post on this day featured Cubs named Pat... lame. To conclude, I imagine most of the heavy consumption that is forever tied in with the day will be done this weekend (unless you're really dedicated and are taking a three-day weekend just for this). Anyway, I hope everyone does so responsibly. Meanwhile, I think I'll settle for a bowl of lucky charms and some corned beef (I despise cabbage, sorry). Happy day where everyone is Irish! Happy St Patrick's Day Tony! Wow - great post! Even with the time on hand, I don't think I'd ever be as creative!